1. This is the Character Selection Screen. Here you are able to see all of your created characters. In the world of Fiesta you are able to create up to 5 characters per server. If you are ready to create your first character click the ‘Create’ button. 2. The world of Isya is protected by five character classes: Fighter, Cleric, Archer, Mage, and the Trickster. Each class is equipped with different skills and plays a different role when partying in dungeons or fighting guild wars. Select the class which bests suits the role you wish to play in Fiesta. Click the card of the class you would like to create. After you select a class you must then select a gender. Click the ‘OK’ button to continue. 3. Next you must choose your character's name, hair style, and hair color. Once you have done so, click the ‘OK’ button. We are almost ready to start playing. 4. When you create a character, the Character Selection Screen will appear. To enter the game double-click a character or select a character and press the ‘Enter’ button. Now you can enjoy the world of Isya and become a champion of Fiesta! Happy hunting. To log in and play Fiesta you must have a verified gamigo account. 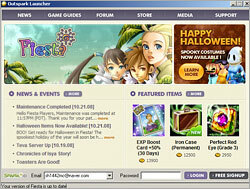 Now that you have a Fiesta account, and have already downloaded and installed the client, you can begin playing. Click on the Fiesta shortcut to begin the gamigo Launcher. When an update is needed the launcher will automatically download the patch. Once a patch has been downloaded Fiesta will apply the patch on its own. Please note that this may require a few minutes depending on the size of the patch. Once the launcher has patched completely the ‘Login’ button will become enabled. You are now ready to play! Enter you account name and password and click ‘Login’. The game of Fiesta is separated by worlds or servers. Your character lives in the specific world you choose and cannot be played on any other worlds, so choose your server carefully. Currently Fiesta only offers its players non Player vs. Player (PvP) worlds. This means that PvP will only be allowed during events and on special maps. Once you have selected your world, click ‘Join’ and to go to the Character Selection Screen. This is the Server Select Screen. On this screen you will be able to choose the server you wish to play on. You may have characters on both servers if you wish, but they will not share the same storage space. Copyright © 2013 - 2019. Core Inc, All Rights Reserved.